How Do I Measure Plastic Film Thickness? 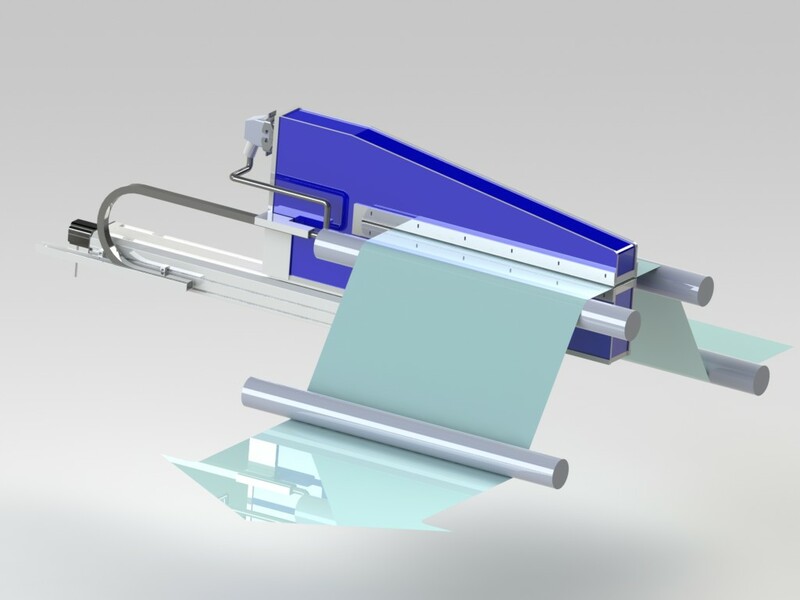 SolveTech Thickness Gauging has 37 years of experience in measuring plastic film using our proprietary gauging technology and other available methods. 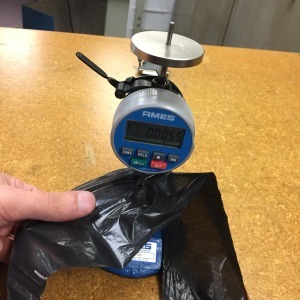 This page is dedicated to educating our customers on the different methods available to measure the thickness of plastic film. If you have any questions, feel free to contact us here. We are typically either looking to measure film thickness and variability across the web or in the machine direction so that we can see the uniformity of our film. Film can vary in either direction depending on process conditions. 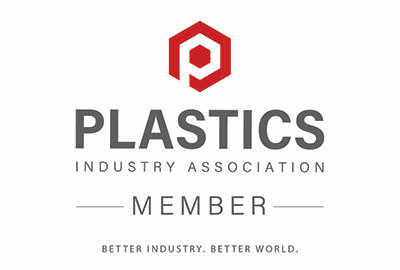 Plastic film presents some unique challenges, and there are many tools available to help you. Update 2017: New ASTM Standard D8136 For Measuring the Thickness and Variability of Plastic Film available here. This article will discuss off-line gauging and on-line gauging for plastic film, including blown film and cast film. There are three main ASTM standards that apply to measuring plastic film thickness. You can see the article discussing the ASTM Standards here. Should I Use Contact or Non-Contact? Watch the video below to see the comparison. Measuring in the lab is usefully a good first step for quality control. Many plastic film producers or buyers will want to know the thickness and thickness variability of their film for performance and quality reasons. The average thickness can be calculated using the density, weight, and cross-sectional area of a piece of film using gauge-by-weight. However, to get film thickness variability you will need to measure multiple points along the film to see how much variance there is in thickness. Typically, there is a specification that buyers want and a producer will need to meet. SolveTech is an ASTM member and worked with the ASTM to developed new standard D8136 for non-contact thickness gauging which has better R&R (repeatability and reproducibility). It also defines profiling a film and allows buyers and seller to define film variability in a standardized way. There are several different things to consider when measuring film in the lab which are presented below. With a thin material like plastic, you will need special tools to get an accurate measurement which can be either contact or non-contact. Below, we will compare the contact and non-contact methods and explain when each is appropriate. Contact gauges are an easy and simple solution, but have some drawbacks. A micrometer can be used to measure thickness fairly easily in the lab, but the issue is accuracy when it comes to thin films under 2 mils. May have bias in the reading from compressing the film. ASTM Standard D6988 discusses using a dead weight caliper for measuring the thickness of plastic film. Section 10 discusses the precision statement, and there it states that no precision statement can be made because of the all the factors involved. In SolveTech’s experience, and micrometer can read accurately to +/- 0.05 mil. However, when measuring a 0.5 mil film, this would give you an error of +/-10%. With non contacting gauging, you can be much more accurate at around +/- 0.2% for this thickness of film. Additionally, a surface finish on a film will typically give a micrometer an error. Usually it will skew the reading high because the device will rest of the peaks of the rough surface. For most plastic films and especially thin films, non contacting gauging is the method of choice to get an accurate and quick reading. Many capacitance gauging systems are set up as profilers, such as SolveTech’s PR2000 Precision Profiler. Profilers are helpful because they can provide a picture of the film thickness across the web or in the machine direction. You can bypass the calipers by calibrating based on the average thickness of a strip. 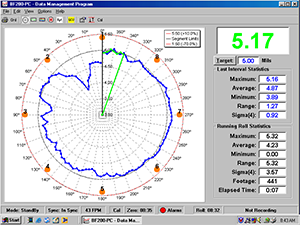 This is known as the gauge by weight method and it is built into the PR2000 software. Measures a samples quickly and easily which saves time and money. 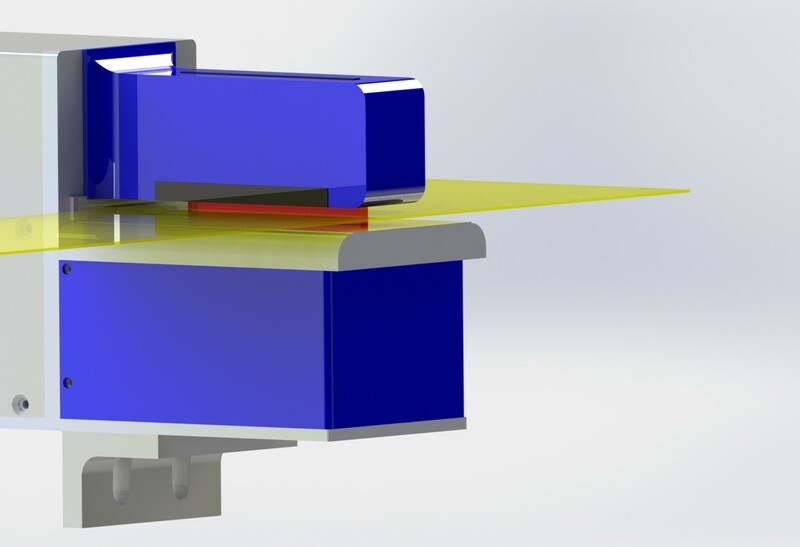 Capacitance technology will tell you the overall thickness of the material you are trying to measure. However, coating thickness can still be measured if you are able to measure the material before the coating is applied and after the coating is applied. You can then do a subtraction of the before and after to get the delta. There are other technologies on the market that can be helpful when trying to read individual film layers using NIR for example. Capacitance has a drawback in that it can’t measure conductive materials and it can also be sensitive to variation in moisture levels. Measuring on line is a great tool for monitoring your quality in real time. Catching an error can help reduce waste and improve the products you are producing. Additionally, producers can sometimes down gauge their average thickness if they produce a more uniform film. A thin spot in the film is like the weakest link in a chain, so if it is eliminated, the film becomes stronger overall. Down gauging can save some producers a great deal of money in material costs. In many cases, live feedback control is used to help make automatic adjustments to the extruder. Contact gauging is typically not practical in this case due to the high speed of the line, so non contacting methods have been widely adopted. 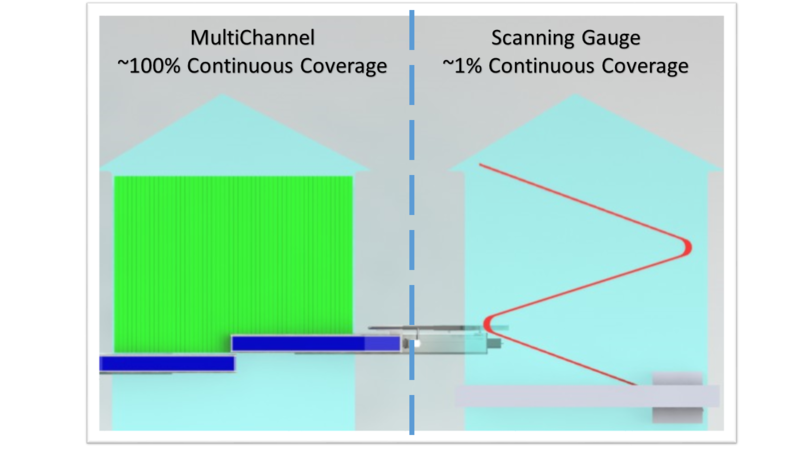 It is important to understand some key concepts for on line gauging, and different processes will have some different needs. 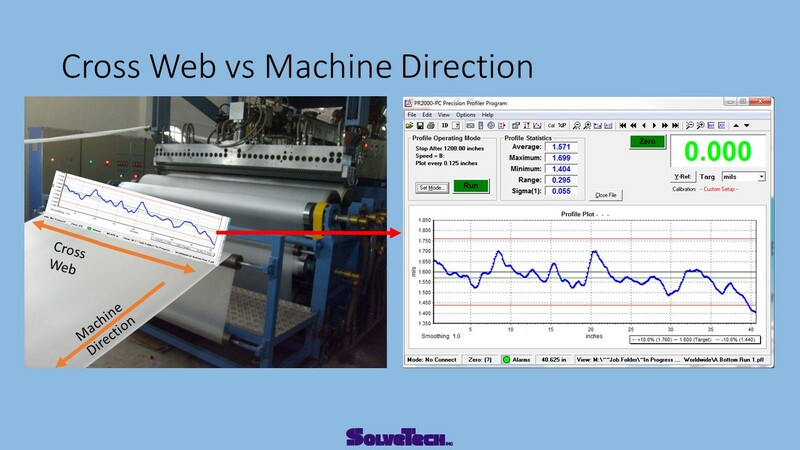 You can measure both in the machine direction and in the cross web direction. 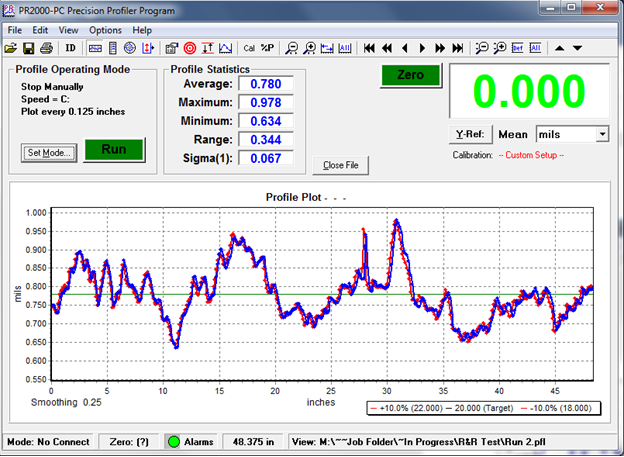 Cross web measurements are more typical, but machine direction gauging is gaining in popularity. There are several styles of blown film production equipment: no rotation, and oscillating die, and an oscillating haul off. Thickness gauges that measure on the bubble are used to provide the thickness of the film as it is being produced. They typically use a capacitance based technology, although it is different the technology SolveTech uses for it’s capacitance gauging systems. These systems scan the bubble using a circular slide and give a relative measurement, meaning that they measure the variability across the web. They have difficulty measuring absolute thickness because they have trouble holding calibration. They are however popular on many blown film lines because they can provide feed back control to the die. If the density is known, they can use gravimetric control to calculate the average thickness. However, in practice, the exact density is not always known or entered correctly, and the dimensions of the bubble also have to be considered. 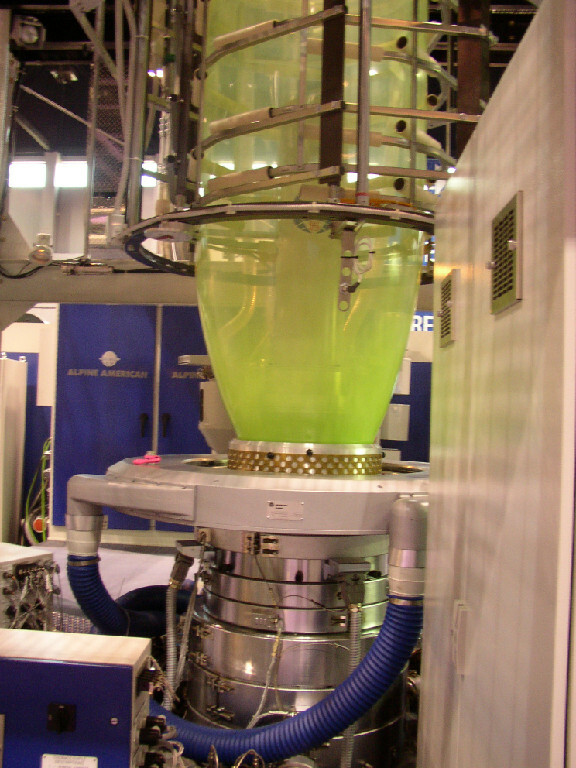 Some blown film companies also find these machines to be complex to operate and maintain. A simpler and lest costly approach is to measure the thickness after the lay flat, meaning after the bubble is collapsed. SolveTech’s BF200 measures material after the lay flat using a spot along the edge or both edges. If either the die or the haul off is rotating, the system can map the entire bubble by measuring one point along the edge. This is because the bubble profile will rotate through this one point over time, and the rotation speed can be tracked. Besides being simpler to operate and more economical, these systems are easily retrofitable to existing blown film lines and can hold calibration for an absolute measurement. The disadvantages are that there is more process time between the creation of the material and when it is measured, and if there is no rotation on the line, you can not get a bubble profile. There can also be some challenges when doing feedback control when using a oscillating haul off. This is because twisting of the bubble can distort the profile. Overall, these systems have been widely adopted, and SolveTech is a leader in this area with well over 150 installed. For cast film, producers will often measure thickness across the web and make adjustments to their die accordingly. For wide webs, many customers will use a scanning gauge of some kind. Scanning gauges take a measurement head to scan it back and forth across the web to create a thickness profile. Some typically technologies include x-ray, gamma backscatter and beta ray gauges. There are also some capacitance based technologies and optical technologies that are used. For measuring a coating thickness, IR is popular. For narrow webs less than 60 inches, many producers use a C Channel capacitance gauging system. SolveTech offers our unique Multichannel which does not scan and instead offers full and contact coverage of the web using multiple channels. This system has been widely adopted as the standard in narrow web since it has superior performance to the other scanning gauge technologies, and it can give a high percentage of coverage. Biaxial Film is stretched in two directions. There is typically a scanning gauge that goes across the web and controls the crossweb variability. These systems are typically either infrared or nuclear systems. 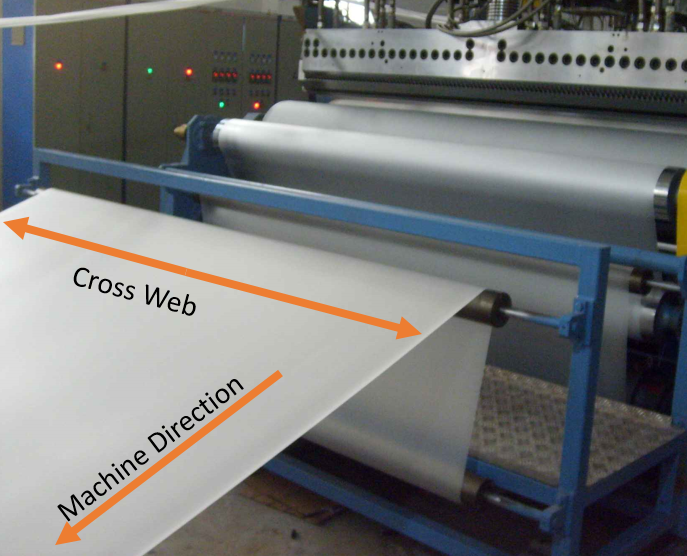 Along with measuring the cross web like in cast film, it may be important for the producer to measure the thickness variability in the machine direction. This is a SolveTech specialty due to our unique gauge design, and for more information, you can visit our page on machine direction gauging. For measuring biax film off-line, using a Profiler with a spooling mechanism can be very helpful. 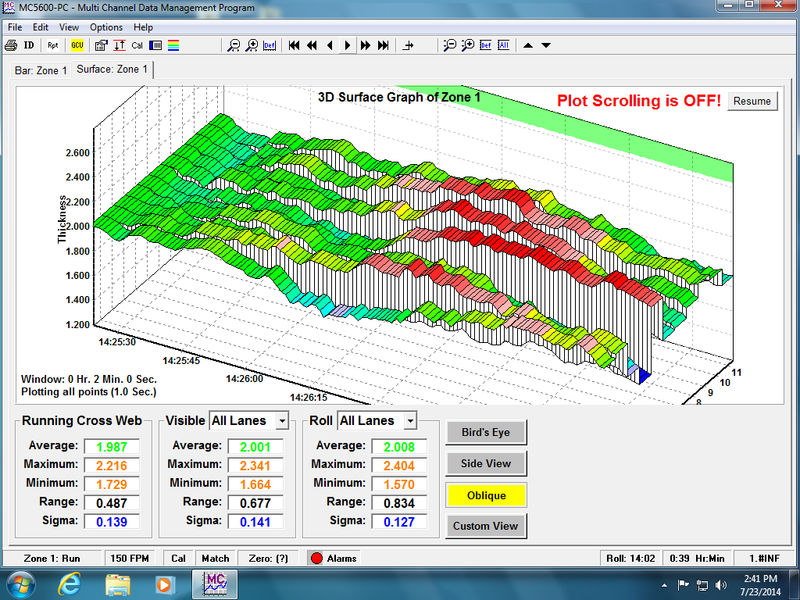 Biax lines are typically very wide so long samples need to be analyzed to look at the material variability. In summary, there are several methods available to measure plastic film thickness, and the one you select depends on your need and process. You can learn more about what thickness gauging can do for a blown plant here. 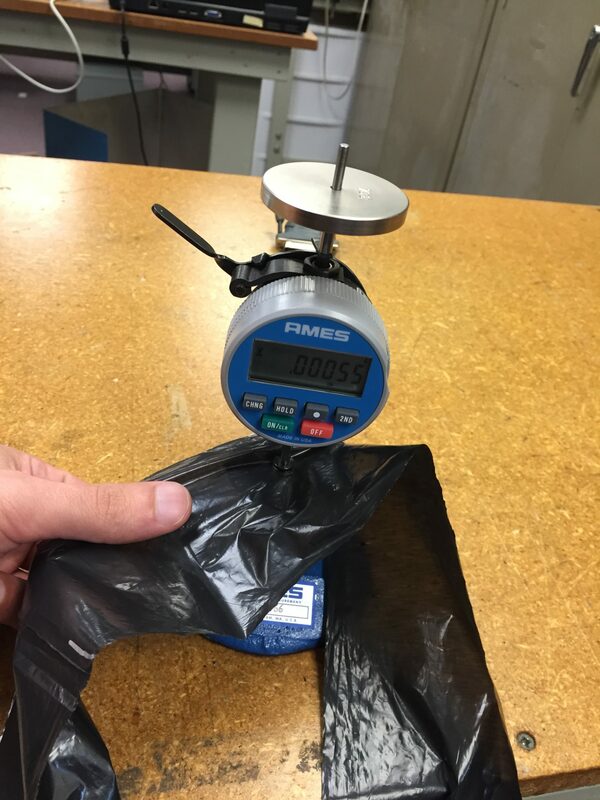 For more information on thickness gauging for plastic film, please contact us at info@gauging.com or at 1-302-798-5400, and we would be happy to answer your questions.